Confession: I have never made a real cassoulet. I have had it at restaurants, yes! And it is always wonderful. From what I have heard and read it’s a lot of work and time. Using ingredients such as duck fat and gelatin, it looks as though this thing needs to be cooked for 5-6 hours. Delicious yes, but not your average week night meal! So here is a quick version of cassoulet. No duck fat, but yes to sausage and chicken! The recipe keeps it simple and allows you to make it in less then an hour. 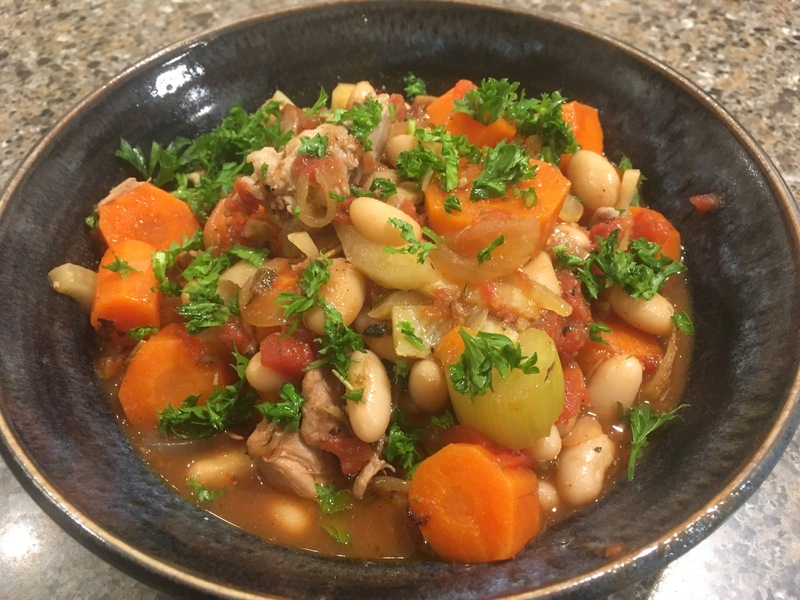 Chicken, sausage, white kidney/cannelli beans, carrots, fennel are all simmered together in a quick stove-top stew. Simple, quick and tasty. The key to this recipe is the buttery breadcrumb topping. So enjoy some French cooking without the hassle! Heat large pan or dutch oven on medium high. Add onions, cook until they start to soften. Add garlic, fennel bulb, carrots and celery. Cook until vegetables start to soften. Add herbs. Cook for a minute. Add chicken and sausage. Add four and stir well. Add beans, wine, diced tomatoes and salt and pepper. Stir weill. Bring to a boil. Reduce heat and simmer for 10-15 minutes, until chicken is cooked. Meanwhile heat a small pan on medium. Add butter and breadcrumbs and cook for about 5 minutes. To serve, top with parsley and breadcrumbs.